Reshape projects will take part of Fashion Digital Night, a new Fashion event organized by Fondazione Mondo Digitale in the frame of Altamoda event, 25th to 27th of January 2019. During the Roman event, AltaRoma, Fondazione Mondo Digitale will present the digital transformation in the fashion industry with the “Fashion Digital Night”. Fondazione Mondo Digitale selected five projects from the Reshape platform which will be presented in the catwalk and Exhibition area. The catwalk at Fashion Digital Night (25th January 21:00 pm – PRATI BUS DISTRICT – Sala 1 Viale Angelico, 52. Roma.) will be a showcase of selected wearable technology projects from 14 countries around the world. Moreover, the event will host the Design exhibition. 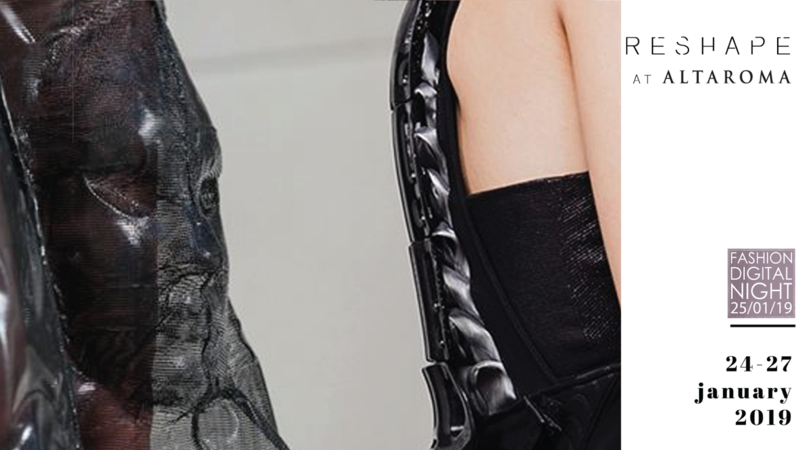 At the Fashion, digital night event will participate institutions and industries partners of Fondazione Mondo Digitale as Phyrtual, Alta Roma, 3D´TALY Moodart Fashion School, Accademia Italiana, Fashion Concept, Trotec, Fabricademy, Itmakes, Consulate of Italy in Barcelona. Fondazione Mondo Digitale (FMD) works for an inclusive knowledge society combining innovation, education, inclusion and core values. The benefits that come from knowledge, new technologies and innovation must be for the benefit of all people without any kind of discrimination. The mission of the FMD, therefore, is to promote the sharing of knowledge, social innovation and social inclusion, with particular attention to the categories at risk of exclusion (elderly, immigrants, unemployed young people, etc.). Designers: Snezhana Paderina, Nikita Replyanski, Maria Resplyanski, Christoper Diaz. Designers: Nuria Diago Camps and Maria Carrion Ametller. Designers: Frank Melendez, Hannah Deegan, Zara Tamton.